Service men, past and present, gathered at the Navy Operations Support Center at Luke Air Force Base, Ariz., during a Retiree Appreciation Day event Oct. 28, to commemorate retired veterans in the area. As the event began, retirees gathered in the main assembly room for the presentation of the colors, invocation and a brief introduction from the 56th Fighter Wing vice commander, Col. Michael Richardson. After the introduction the retirees were able to explore the exhibits from on-and-off base agencies who provide medical and informational resources including the Defense Finance and Accounting Service and Veterans Administration. Senior Airman Anthony Felix, 63rd Aircraft Maintenance Unit crew chief (right), and Airman 1st Class Blayne Exline, 63rd AMU assistant dedicated crew chief, showcase the F-35A Lightning II to retirees at Luke Air Force Base, Ariz., Oct. 28, 2017. 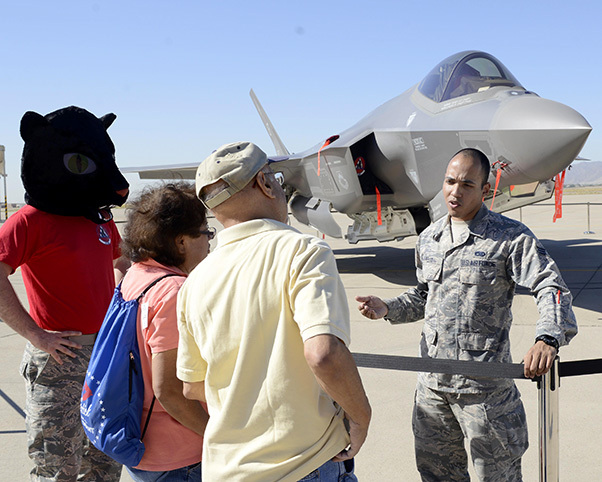 During the Retiree Appreciation Day event, system matter experts were placed around an F-35 and F-16 Fighting Falcon static displays to answer any questions the retirees had. Along with the information the retirees were given, multiple operational demonstrations were also arranged. More than 40 organizations came out to participate in this year’s Retiree Appreciation Day. Staff Sgt. 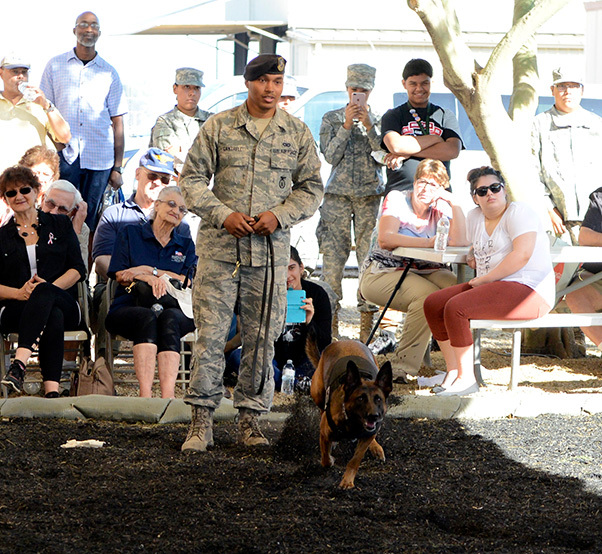 Jordan Cantrell, 56th Security Forces Squadron military working dog handler, gives a demonstration with Ffrida, a military working dog, during a Retiree Appreciation Day event at Luke Air Force Base, Ariz., Oct. 28, 2017. 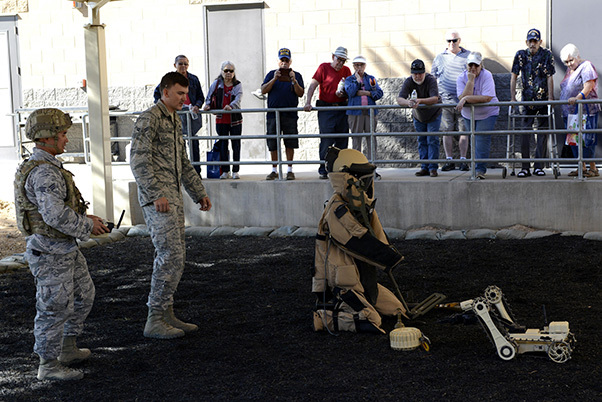 The 56th SFS put on a display of military tactics to educate and entertain retirees. Airman 1st Class Zachary Riesselmann, 56th Civil Engineer Squadron explosive ordnance disposal technician (left), and Senior Airman Daniel Keum, 56th CES EOD technician, demonstrate how to operate a micro tactical ground robot at Luke Air Force Base, Ariz., Oct. 28, 2017. Additional EOD equipment was showcased during the Retiree Appreciation Day event held at the Navy Operations Support Center. 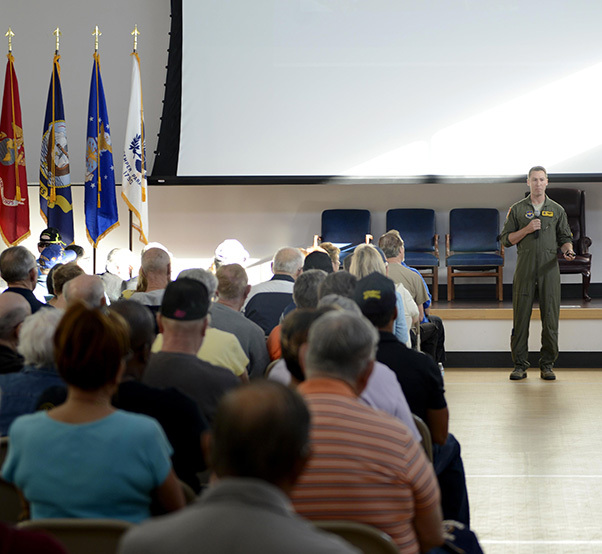 Maj. Ian Osterreicher, 61st Fighter Squadron F-35A Lightning II instructor pilot, gives an F-35 briefing during the Retiree Appreciation Day at Luke Air Force Base, Ariz., Oct. 28, 2017. The brief was held at the Navy Operations Support Center’s main assembly room and focused on the logistics and mechanics of the aircraft. 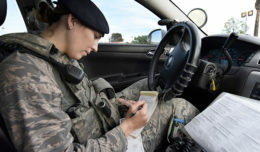 Senior Airman Gisele Adanlete-Engram, 56th Medical Operation Squadron aerospace medical technician, gives a retired service member a flu shot at Luke Air Force Base, Ariz., Oct. 28, 2017. 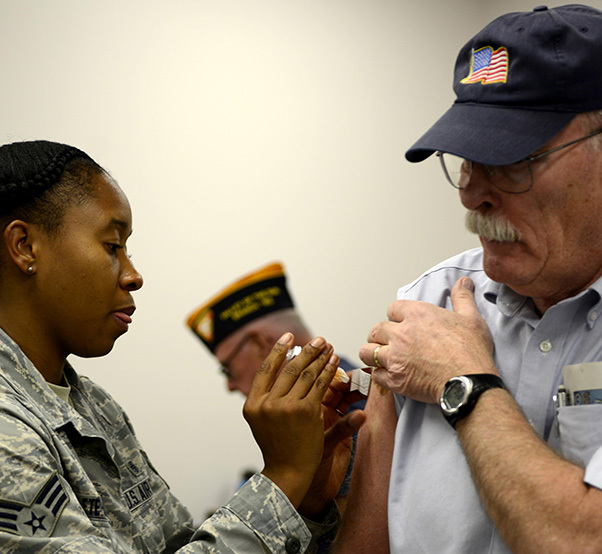 During a Retiree Appreciation Day, the 56th Medical Group offered retirees shots for shingles, flu and pneumonia.